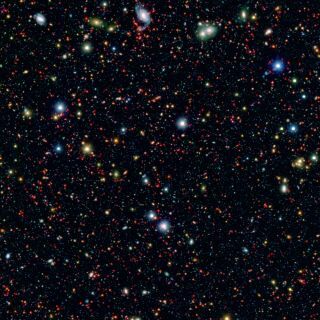 A portion of the COSMOS field, short for Cosmic Evolution Survey, contains millions of galaxies. Image released Sept. 9, 2014. Michael Sainato is a freelance writer with credits including the Miami Herald, The Huffington Post and The Hill. Follow him on Twitter at @msainat1. Sainato contributed this article to Space.com's Expert Voices: Op-Ed & Insights. The Hayden Planetarium, part of the Rose Center for Earth and Space at the American Museum of Natural History in New York City, recently reopened after a temporary closure to renovate its 429-seat theater; add a new, advanced screen that has no visible seams; upgrade its projector, and install a more efficient LED lighting system. Mordecai-Mark Mac Low served as an adviser to the Hayden Planetarium facilities' development and expansion, providing support and research for outreach activities, shows and exhibits, including the museum's latest space show, "Dark Universe," which focuses on the recently discovered, yet mysterious, phenomena dark matter and dark energy. Mac Low also serves as curator for the museum's Department of Astrophysics, specializing in star and galaxy formations and the structure and dynamics of the interstellar medium, as well as serving as an adjunct professor at Columbia University. He recently spoke with Space.com about some of the topics the planetarium will feature, including dark matter, dark energy, antimatter and the search for alien life, as well as his latest research on planetary formation. Our conversation appears below, and you can learn more about the planetarium's new programs on its website. Space.com: What are antimatter, dark matter and dark energy, and why are these three things so mysterious? Mordecai-Mark Mac Low: Antimatter is like matter , except it has the opposite charge, so an antiproton is a negatively charged proton as opposed to the protons in our own atoms that are positively charged. An antielectron, sometimes called a positron, is a positively charged electron as opposed to the negative electrons in our own atoms. Matter and antimatter may meet, and destroy each other, releasing huge amounts of energy. This is the physical kernel of truth that is the basis for science-fiction antimatter drives. We can make antimatter and also can observe antimatter being made naturally in the form of high-energy particle collisions. Antimatter turns out to be part of the nature of the universe. It's an interesting question — why the universe has so much more matter than antimatter, which goes back to conditions in the extremely early universe. Antimatter is something we can observe; it shows up in our detectors and has well-defined behavior and consequences when it encounters matter, so that's why I call it the least mysterious of those three things. Dark matter is a label on something that we have to infer because we can't detect it directly. If you have two objects orbiting each other, you can infer their mass from the speed with which they orbit, and that's a direct consequence of Newtonian gravity. If you orbit something more massive, you move faster. If you look at galaxies orbiting each other, you can play the very same game as for planets orbiting a star, and infer how massive the galaxies are by how fast they're orbiting each other. So, all the way back in the 1930s, [astronomer] Fritz Zwicky already realized that if you look at clusters of galaxies and measure how fast the galaxies are moving and compare [that] to how much mass is in the stars of the galaxies themselves, that there's something wrong. The galaxies are moving far too fast, implying there's a lot of missing matter. It turns out, some of that matter was regular atoms in between the galaxies, hot 10-million-degree gas around the galaxies. But that only solves part of the problem. There's still a factor of 6 error that, to this day, has not been placed to any detectable particle or type of matter, and yet that matter is clearly there; there's a mass there. Since those days in the 1930s, many different lines of evidence have been found to show there's extra mass in the universe, and really quite a lot — 5 times as much as all the atoms, all the regular matter we can observe, and yet it cannot be readily detected. So far, it has only been detected by the action of gravity on visible matter. Each individual galaxy is spinning too fast for the matter in it, implying there's dark matter inside individual galaxies and surrounding them. If you look at light from distant objects, it gets bent gravitationally by intervening galaxies or clusters of galaxies, and that bending is too strong for the visible mass, so there must be additional mass causing the light to bend more strongly than would be actually be seen and so forth. People are now making increasingly heroic efforts to directly detect a particle that could be a dark-matter particle, and there are many theories [as to] what that dark-matter particle might be. To date, none of those searches have been successful, but bigger instruments are being built and deployed, and perhaps those will find the answer. Some astronomers think it's actually not a particle, but rather a slight change in how gravity works that is causing this phenomenon. But so far, it has been difficult to make a mathematically self-consistent model that would agree with general relativity and all the observations that support it. So it's a bit of a mystery, but at this point, dark matter is a very well characterized mystery, in the sense we know there's extra mass or something behaving an awful lot like extra mass and we can measure its distribution astonishingly accurately. We can even show [that] the universe at the largest scales wouldn't have the distribution of galaxies it has without dark matter being present. We can do simulations with and without dark matter, and the universe looks entirely wrong without dark matter taken into account. Last and definitely not least, dark energy: This has been the surprise of our time. So the universe has been expanding since the Big Bang. The matter in the universe is exerting gravity on everything else in the universe. If there were just matter in the universe, the universe would slow down in its expansion. Gravity would tend to pull it; indeed, it might even turn around and begin to start contracting. For many decades after the discovery of the Big Bang, this was the theoretical expectation — that the universe would slow down as time went on. In the 1990s, it became possible to measure distant enough galaxies to be able to directly measure how fast the universe was slowing down, and this was done using various clever techniques involving measuring the brightness of distant supernovae and comparing them to the brightness of nearby supernovae. When the first groups sat down and tried to do this, they found a very surprising result. In one of the groups, they had compiled measurements of many supernovae, and one of their graduate students [Adam Riess] sat down to put them all together on a graph to see how fast the universe was slowing down. Well, lo and behold, not only did he not find how fast the universe was slowing down, but his results had a sign error: Instead of a negative deceleration, he found a positive acceleration. He found the universe wasn't slowing down; it was speeding up. I'm happy to say he eventually shared a Nobel Prize for finding that sign error, because it turned out, when everyone else in that group and others in competing groups checked the results, everybody got the same sign error. They found the universe wasn't slowing down as everyone expected up until that point; instead, it's speeding up, expanding faster and faster over cosmic time. It's acting as if something were exerting an additional pressure to act against gravity. Since pressure can be shown to essentially be equivalent to energy, and since it can only be observed so far by its action on the large-scale behavior of the universe, it's called "dark" — not observable yet — energy, something acting like a pressure. So that's dark energy. It is clearly present in the sense that its effect now can be well measured, to the 10 percent level, and if you don't include it in simulations, you get the wrong distribution of galaxies. But what, exactly, dark energy is even less clear than dark matter. Some people argue that, in fact, it is the cosmological constant Einstein initially introduced to make a steady-state universe, but after the Big Bang was discovered, he removed it from his equations, saying it was his greatest blunder. Well, he may have had it right to introduce that term, but simply got the sign and value of the term wrong. So far, no observation has contradicted that idea, but it also hasn't been constrained to very high precision. Telescopes coming online over the next 10 to 20 years should give us a much more detailed view, and show whether this is, in fact, what is really going on — which will give physicists a great deal to think about, or show some deviation from that idea, which will also help lead us to a better understanding. Space.com: What are chondrules, and what is their role in planetary formation? Mac Low: I just co-published a paper a few months ago in [the journal] Science Advances in which we ran computer simulations of how objects the size of small rocks, fist size to human size, can be swept up in the initial protoplanetary disk that surrounds a star before planets form. We ran these simulations on a big enough computer, using the European supercomputer network, the PRACE network, at a high enough resolution that we could actually see in our simulations what the distribution of sizes would be. We found that distribution by itself had too few large objects to explain the observed size distribution of small objects, planetesimals — what we now call asteroids. If we then assumed those initial planetesimals accreted, grabbed from the disk lots and lots of little millimeter-sized grains of sand — what we now call chondrules, that would grow the largest objects sufficiently to match the observations. That also matches something we know from our meteorite collections here at the museum, which is that many of the most primitive meteorites are made of these tiny melted glass beads, called chondrules, and that's consistent with this idea that the biggest planetesimals accreted chondrules, which later got knocked off in smaller rocks and became meteorites. That could be an explanation of how that proceeded. Space.com: The Fermi Paradox is an attempt to explain why we are seemingly alone in the universe. Early 20th century physicist Enrico Fermi believed that if alien societies exist, one of them would have easily colonized galaxies in the span of a few million years. The time scales for colonizing galaxies is miniscule compared to the age of the universe, so if any existed, we would have seen some signs of them, he reasoned. How would you answer the Fermi Paradox, and how much of a long shot are the efforts of the SETI Institute (search for extraterrestrial intelligence)? Mac Low: The idea that the Earth would be unique in generating life seems slightly improbable. Here's what we definitely know. We know physics is the same across the universe. We can measure extremely distant objects following the same physical principles as we do here on Earth. We know simple chemistry is the same across the universe. We can measure simple molecules, such as carbon monoxide, [made of] two of the most common heavier elements. We can measure its spectrum in distant quasars literally 10 billion years old and three-quarters of the way across the observable universe, and it behaves just like carbon monoxide does here on Earth. So, we know that chemistry is the same everywhere. Well, biology is essentially a consequence of physics and chemistry. To think that the Earth is unique in its biology even though its chemistry and physics are the same as [those of] hundreds of billions of other Earth-sized planets in our galaxy — which we know, from observation, is approximately right — and hundreds of billions of other galaxies, each with their own hundreds of billions of planets… Well, that seems improbable somehow. Of course, then the next question is, where are they? That is, if our civilization, with our level of technological advance lasted another 100,000 years — a blink of the eye compared to the 2 million years since [our] genus, Homo, started evolving, [and] even less than a blink of the eye compared to the time our galaxy has been around — we will probably be sending out colonies, settling on other planets that themselves send out new colonies. Why haven't they arrived here? Maybe star-faring civilizations don't last that long. Maybe they tear themselves apart when they master the great energies required, just as we have mastered the relatively minor energy of nuclear fusion — we don't really know. That's one of these things where we are still trying to characterize the problem, and SETI is probably our best bet in getting any sort of handle on the prevalence of any sort of intelligent life. Meanwhile, observational planetary science is going ahead looking for atmospheres out of chemical equilibrium that may indicate some form of life on exoplanets, and in the next 20 to 50 years, we might be able to actually determine how [prevalent] life is in the universe. There are already proposals being put on the table for the next generation of space telescopes beyond the James Webb Space Telescope and WFIRST [Wide-Field Infrared Survey Telescope]. There's a proposal called the High Definition Space Telescope, a 12-meter [40 feet] space telescope that could, if it were built, measure the spectrum of a planet the size of Earth with sufficient detail to determine whether there were biological processes possibly occurring on that planet.